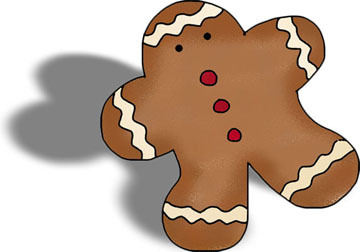 This gingerbread man pattern can be cut out of wood and painted or cut out of cardstock and decorated. He would be a cute ornament on your Christmas tree or use as a decoration on Christmas presents or baked goods. Cut pattern from 3/4" pine if the gingerbread man will be standing or 1/2" plywood if you are making a gingerbread man that will hang. Small rick-rack can be used on the gingerbread man's arms and legs instead of being painted on. Small seed beads could be used for eyes and beads a little larger for his buttons. If hanging, when finished drill a hole in the top of the head. String the wire through it and loop the wire. Or ribbon or gold cord could also be used. There are many other ways to make this gingerbread man besides out of wood. Cut the basic shape out of cardstock, and decorate with rick-rack and beads or use paints. 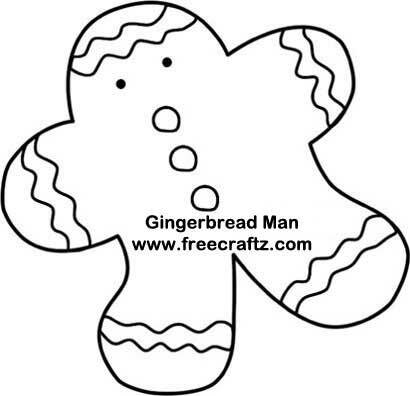 Or just print the pattern and the gingerbread man can be a coloring project for your kids. Use as a decoration. Add To: and From: on the gingerbread man's body and attach to Christmas presents. Punch a hole in the top and attach a gold ribbon or embroidery floss.